It is ruggedly built (I have dropped it several times and it has kept ticking without a hitch). Despite it's form factor it has got a full size layout for its keys (sans number pad). Which is always important. I hate feeling cramped while typing. It's easy to grab and slide into my bag when I need to just go. But, that all said, there are a few drawbacks. Small stuff mostly, but chief amongst them is the Apple keyboard's need of batteries to function and it's ability to have it's bluetooth connection turned on by accident (draining the batteries of both your device and the keyboard) if the large button on its side gets touched by a feather. Both of these issues caused me to reevaluate my selection of a keyboard and at least start to research what is out there nowadays for alternative options. Suffice it to say, I found a lot! 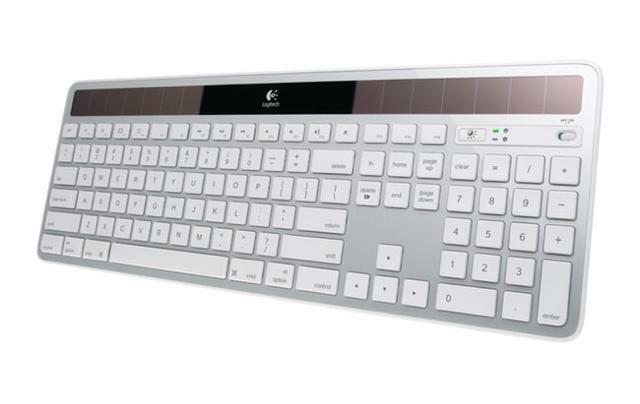 The best options built specifically for the Mac, that weren't built by Apple, seemed to be offered by Logitech. They have a great selection with a lot of options, but in the end I settled on their series of solar powered keyboards. They support all of the current Apple command key shortcuts, have zero need for batteries (fully charged, it can be used for three continuous months in complete darkness) and, in the case of the travel version, they have the ability to hot swap between multiple bluetooth devices. Which is handy if you need to quickly disconnect from one device and quickly pair with another (from an iPad to a desktop, for instance). They both perform easily as well as their Apple manufactured counterparts and while they don't feel as well built as Apple's aluminum keyboards, they by no means feel cheap in any way. Function-wise, they both have worked flawlessly. I love that the hotkeys (the "F" keys) that are in the top row of the Apple keyboard, can all be found on the Logitechs (the media-based buttons work even on the iPad!). Also, eco-stance aside, I really love that I don't have to worry about having my rechargeable batteries around and charged up when my keyboard dies. The solar cell at the top, does change the footprint (and the aesthetic if that's important to you) obviously, making the keyboard, in both cases, taller. But the exchange for battery life and the simple convenience of putting it in any kind of light to recharge it, definitely trumps these quibbles for me. The bluetooth hot swapping on the K760? It works as advertised and is pretty damn amazing! Once paired up (easy to do as well) I was swapping between my iPad, iPhone and Macbook with a simple keystroke. It's fast and way more convenient than I originally anticipated. Definitely not a gimmicky feature! It is the real deal and quite helpful. One odd difference between the two? The K760 keys are WAY more "clicky" than the K750. So if you are into that, or are obsessive about stealth typing, than you may want to take a note of this. I noticed it right away. Lastly, the K750 comes with a free app you can snag from the Mac App Store that gives you real time info on your charge and the amount of light/solar energy your keyboard is currently receiving. Pretty neat to bring up and watch, not to mention handy if you need to know how much juice your keyboard currently has left. Again, it's only for K750, but it is well implemented on the Mac. So if it wasn't clear enough yet, I will come out and say it: I am pretty smitten with these keyboards! I've used the K750 for a month now and the K760 for a little over week. They have not given me one bit of buyer's remorse. Quite the opposite actually. I wish more peripherals were made with this kind of utility and function. Two thumbs up! Way up! Highly recommended!